One of the main concepts I teach is that it's not about you when it comes to your direct sales business. I truly believe that when you focus all of your energy on making it all about others (your hosts, guests at your parties, your team members), you always get what you need. That's why I hate the questions, "Would you like to book a party with me?" and "Would you like to learn more about my opportunity?" 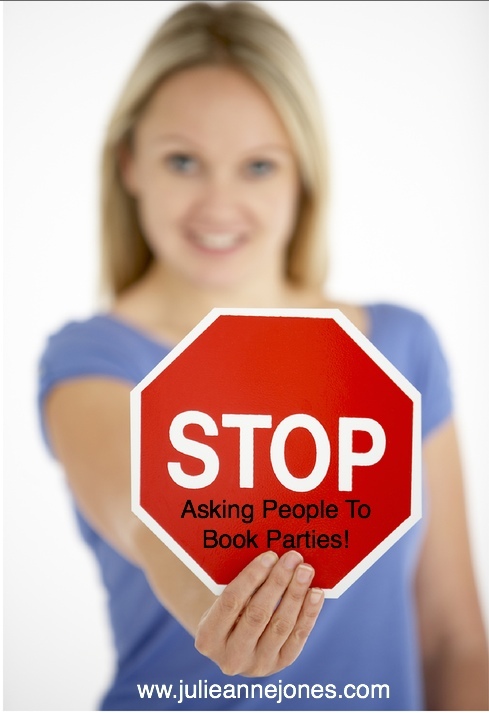 How to get your guests to love you, love your product and BEG YOU to let them book a party! It's not too late for you to join us tonight! Click here to get signed up! But back to those two nasty questions…Just think about it for a second. Who are both of those questions about? You, right? There's nothing in either one of them that makes me feel like you're making it about me AT ALL. Plus, just from a purely practical standpoint, they're also closed-ended questions (meaning they can be answered with a yes or no). That usually leaves you no place to go when it comes to overcoming objections and supporting the person in seeing what's possible. See how easy that is? You're still using a question, but now it's an open ended question proceeded by lots of acknowledgement. And it's clear that you're more interested in her needs than your own. I'm wondering how you feel about this and whether or not you think you can make this shift in your business. I'd love it if you would share below. P.S. I took the above scripts from my e-book "Powerful Language for Direct Sales Success; 12 Scripts Tell You Exactly What to Say to Get the Booking, Sponsoring, and Sales Results You've Always Dreamed of." It's one of my most popular products.